Rhapsodic story from a small Finnish town in the 1920s. The wounds of the civil war in 1918 are not yet fully healed. The current ban legislation on alcohol triggers a diligently moon-shining. 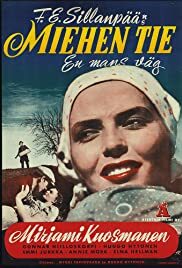 Drama about a young woman in rural Finland in the 1930s. The small village provides a scene for intrigues, fights, love, jealousy, accusations, and revenge. A love triangle of two sisters, both passionately desiring the same man. A couple who have moved from the city manage a collapsing farm. The man Alfred is an alcoholic, therefore the responsible to solve the situation is his wife Katriina. Help is provided by the former owner Hermann. About Olavi, a farmer's son who leaves his home after a dispute with his father and leads a life of a womanizing logger. An embittered woman, leader of a criminal gang, has a change of heart. What a loss it was for the whole area of movie making when Nyrki Tapiovaara, maybe the most talented director ever in Finland, fell down defending his country in 1940! Just before Tapiovaara's last days came out the last one of his five masterpieces; a strong drama called "Miehen Tie". In this film can be seen the strong influences of Sergei Eisenstein as together with Erik Blomberg they managed to make the storytelling so brilliant by using some beautiful silent shots combined with overwhelming emotions. "Miehen Tie" is very different from its time and it can only be adored how acting is kept so cool and dark all along the way. The dialog works perfectly as the original writer of the novel, F.E. Sillanpää, adapted the work for the screen. This is a real pearl from the old times. It's also a very important part of the history of Cinema and should be seen by everyone keen on early Soviet films.